The Top Ten Reasons Why You Should Take a Bite out of Homelessness! The Top Ten Reasons Why You Should Attend the Worcester Sharks Game on Saturday, December 13! 10. Take a BITE out of Homelessness! All proceeds from ticket sales, raffles and the jersey auction will benefit RCAP Solutions local homelessness prevention programs! 9. Catch the Sharks wearing “throwback” IceCats jerseys from 1994! 8. Celebrate 20 years of Hockey in the City of Worcester! 7. Freebies! Attendees will receive a Worcester Hockey Mascot Poster featuring FINZ and Scratch! 6. Former IceCats players will sign autographs with FINZ and Scratch during the intermissions! 4. Create memories! This is a great (and low cost) family night out! 3. 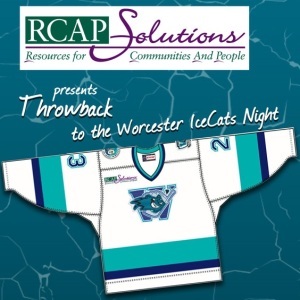 All game worn jerseys will be auctioned/raffled off, benefiting RCAP Solutions! 2. Sharks Feeding Frenzy! Specialty Jersey Games have a lot of energy – players (and fans) go wild! 1. See President & CEO Karen Koller drop the puck! Have a fun night out and support local families at the same time! What else are you doing on 12.13.14??? Gold Level Discounted Tickets just $12 Each (Face Value of $20)! Contact Maegen McCaffrey, 978-630-6714, email: mmccaffrey@rcapsolutions.org. Ticket sales and auction proceeds will benefit RCAP Solutions Client Services Programs, serving over four thousand Worcester county residents and families each year, providing affordable housing, homelessness prevention, home rehabilitation, domestic violence victim support, foreclosure prevention and financial literacy. This entry was posted in Blog, General Interest, Uncategorized and tagged advocacy, Clients, fundraising, RCAP Solutions, Take a Bite out of Homelessness, Worcester Sharks. Bookmark the permalink.